Email, ready to die… again? Cambridge, Massachusetts. 1971. A US programmer named Ray Tomlinson made history. Being part of the ARPANET project, he was the first person in the World to send an email. The first email. 45 years later, and after a lot of attempts to “kill the system”, the email is alive. Maybe, more alive than ever before. In 2016, the number of worldwide email users is over 2.6 billion, and the forecasts show us that this number will increase to 2.9 billion by the end of 2019, according to Radicati’s independent analysis*. Email users will grow an average annual rate of 3% over the next four years, making one-third of the worldwide population email users by year-end 2019. This data supports the email’s good health and contradict those that define email as an outdated and ready to die service. Social media (Facebook, Twitter, LinkedIn, Instagram, etc. ), instant messenger apps (WhatsApp, Line, Telegram, Snapchat,etc.) 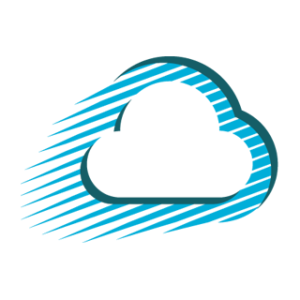 and business communication platforms (Slack, Asana, BaseCamp, HipChat, etc.) have been valuable email alternatives for communication, file sending, or reading news every day. However, data shows that the new communication channels aren’t the end of email as the main service. A recent survey by Adobe found that “Americans are practically addicted to email, checking it around the clock no matter where they are or what they’re doing”. They are mobile. 21 % of Millennials use mobile as unique online connection channel. Email is a mobile-friendly system. It has been the best-adapted system to mobile devices. It’s easy to use and intuitive, as Alexis C. Madrigal highlights in a great article published at The Atlantic. “Email, generally, is mobile-friendly and renders beautifully on all devices. These are the things that the current generation of web companies strive to accomplish. And look at old email, doing all that effortlessly”. Moreover, according to an SDL survey, Millennials check their smartphones 43 times per day, meaning an email is most likely going to be viewed the day it is received. The number of emails sent and received per day totaled over 205 billion in 2015. Of these, 112.5 billion were sent/received by business email users. Roughly 14%** of these email messages delivered to a business email user’s inbox was spam. This figure is expected to grow to about 20% by 2019, according to Radicati’s analysis. If we take into account that six in ten (61%) American workers who use the internet say email is “very important” for doing their job, it is clear that spam could be a big headache to the email industry. However, these trash emails are invisible to us thanks to features developed to filter the valuable emails from the spam for us (for instance by Gmail, with spam filters and the spam report button). On the other side, if we want to evaluate the sector’s health, we have to know the number of accounts that each user manages too. Those figures will grow over the next 4 years, moving from an average of 1.7 accounts per user to an average of 1.9 accounts per user. 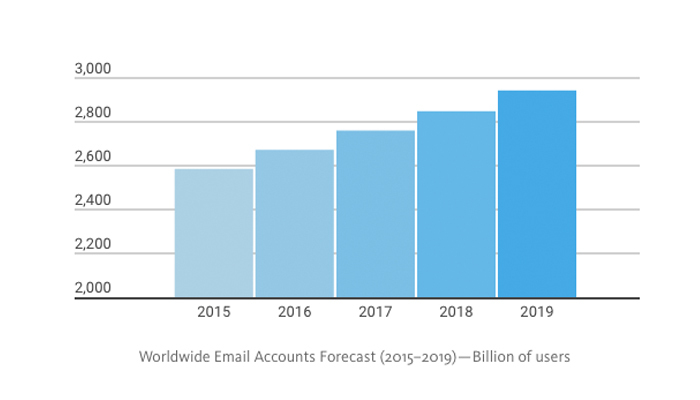 This implies that the number of worldwide email accounts will grow from 4.3 billion in 2015 to 5.5 billion at the end of 2019. Taking into account this data, it’s moment to wonder about the position of the email inside of the new communication environment. What are the most important email features for email users? And in addition, what are the reasons that make the email a tool as important in our lives? We’ll try to reply to these questions in upcoming posts, but what is your opinion on this matter? *According to Radicati’s independent analysis “Email Statistics Report, 2015–2019”. ** The figures for the amount of spam received, reflect only spam that is delivered to the mailbox after bypassing all spam/security filters. These figures include actual spam, as well as what is referred to as “graymail” (i.e.newsletters or notifications that an email user may have signed up for at one point, but no longer wish to receive). Radicati’s analysis.